Posted by I love baby potatoes.. they're super fluffy and just bursting with flavor. Because of their size, they cook a heck of a lot faster than their bigger relatives. 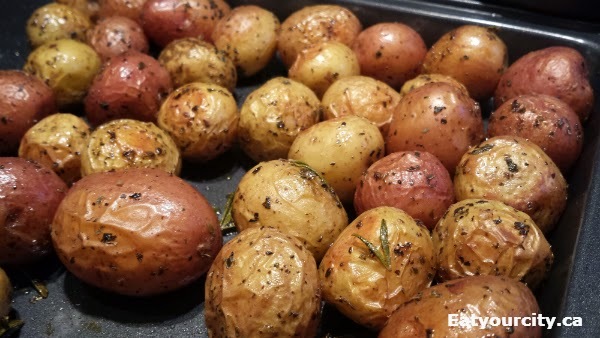 Combine with fresh herbs and roast in the oven = super easy side you can make anytime! Using herbs (fresh or dried) allows to get oodles of flavor without adding in a lot of salt. If you don't have fresh herbs, you can sub out with dried herbs too.. I use a combination of fresh and dried as some fresh herbs just burn in the oven lol! 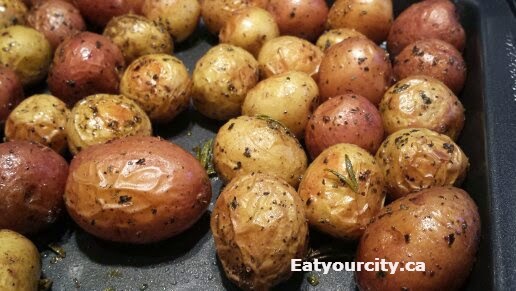 The one fresh herb I love to use with these potatoes is rosemary. If you can get a small twig of fresh rosemary, a little goes a long way. I use granulated garlic as I find I usually burn the ba-jeezus out of fresh ones since they cook waaay faster than the potatoes. 1) Strip green bits off the fresh rosemary twig by holding the stem in one hand and pushing from the top of the twig to the base with the other hand. Roughly chop, or if you're feeling lazy/efficient, you can leave whole and just roughly chop them up... rosemary isn't fussy. 3) Roast in a preheated 325F oven for 30-45min or until its fork tender when you give it a poke.